This month, you can get a Free Christian Audio Book from Christian Audio. 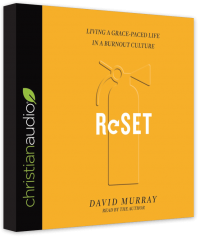 Grab your free copy of “Reset” by David Murray ($14.98 reg) until 4/30/18. Click this Free Christian Audio Book link to download your free copy. Largely due to overwork and the stresses of modern life, men in work and ministry are increasingly run-down, anxious, and depressed. But is this level of physical and spiritual weariness inevitable? Just as a car needs to be regularly refueled, retuned, and repaired in order to keep running, a balanced life can be sustained only when a man takes proper steps to stay on track. In this hopeful book, experienced pastor and counselor David Murray shares stories from his own life and the lives of friends, offering gospel-centered advice for avoiding, assessing, and recovering from burnout.